Last year, we went to Bohol, a province south of Manila, about an hour by airplane. This is my favorite photo from that trip, I have no idea why I did not post it earlier. Haha! 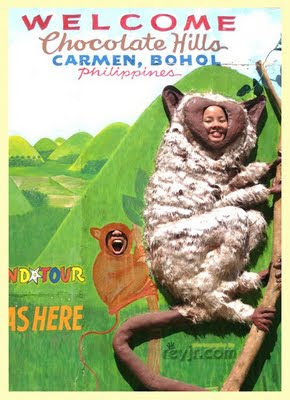 Read all that and more here: "Bohol Bohol"
LOL! Rey, I didn't notice you until I read it from your post. Hehehe. Have you been to Bohol Madz? Wah malas. You should go back! Dali! Don't you own an apartmentbohol in Bohol? Haha. Di ka ba doon nakatira? woot.